Catch up on your zzz in this gorgeous hand dyed duvet cover set. 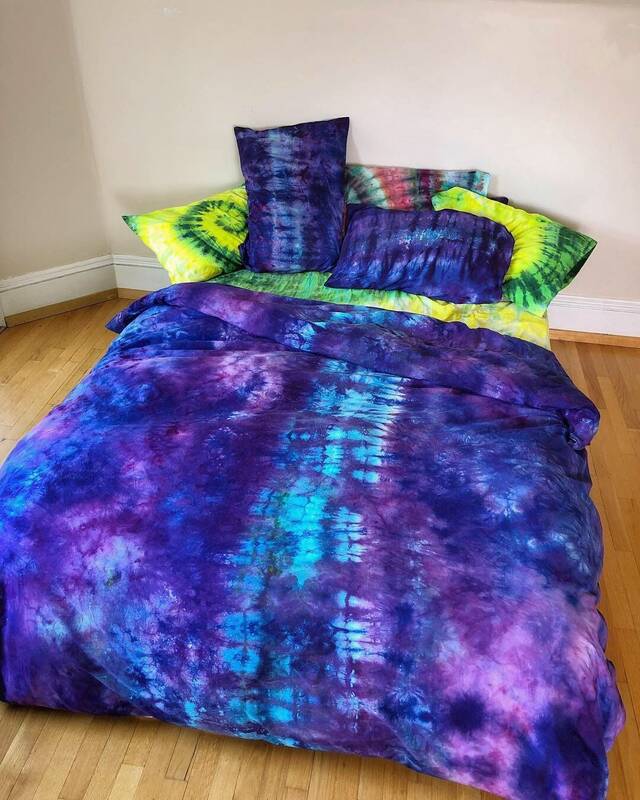 Tie dyed in purples and blues. 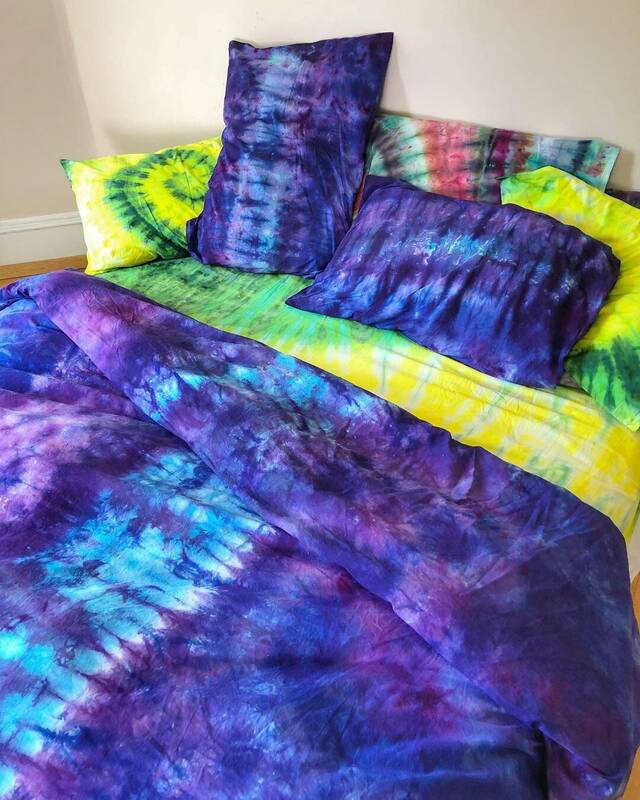 Our tie dyed bedding provides just the right amount of lightweight warmth for year-round use. Duvet cover has concealed snaps that help keep it in place. Set also includes two pillow cases. Great quality and super soft. 100% cotton. Cover will fit queen sized feather duvets. Packages are shipped within 2-7 business days of receiving your order. Airmail generally takes 10-14 business days. Airmail does not come with tracking. If you would like to add tracking to your purchase please message us. It costs an additional $5. We are not responsible for packages that get lost in the mail. Purchasing the additional tracking info (which includes insurance) is recommended. If you have questions about sizing or anything else please e-mail us. To remove excess dye we wash all our tie dye clothing 2 times in hot water. We then tumble dry on warm. This makes them preshrunk and ready to wear. Wash cotton, bamboo or hemp tie dyed items in cold to warm water with other colored items. Tumble dry warm or (save some energy) hang to dry. Turn garment inside out before washing. Wash rayon tie dyed items by hand in warm water or in a washing machine on a delicate cycle. Hang to dry. Yes we wholesale! E-mail us for details. Yes, we can make any of our designs in the colors and sizes of your choice. We especially love tie dyeing for teams, businesses and special events. wholesale pricing available on quantity orders. Contact us with your ideas. All custom orders must be prepaid. We will send you info on how to do this when you send your request. No more than any other colored item bought in a boutique or clothing store. We use high quality commercial Procion MX dyes on all our clothing. These dyes are meant to last and believe me, they do! We wash all our dyed clothing 2 times and use a careful chemistry to insure your tie dye stays vibrant for years. We recommend (like all colored clothing) washing your tie dye in cold to warm water and drying on low heat. Better yet, hang dry your item and save a little energy! Our Rayon and silk garments should be washed by hand or on a delicate cycle in a mesh bag. Hang to dry.